The gentle curves and relatively unimpeded journey between Felton and Ben Lomond ended just north of the latter town. As the Felton & Pescadero Railroad carved its grade north to Boulder Creek, the route proved much more perilous and required several crossings. But there were several stops and stations, almost all registered on Southern Pacific Railroad timetables and station books, and it was also quite possibly the most scenic sections of track in Santa Cruz County. Leaving Ben Lomond, the right-of-way curved behind the current Tyrolean Inn to cross the San Lorenzo River on a mixed trestle-truss bridge. From there, it passed through a large open meadow that would host a number of campgrounds over the years, most notably Camp Thunder, before it was converted into a housing subdivision. Riverside Drive north of Ben Lomond marks the right-of-way in this section and can be easily visited today, although no railroad relics remain beside the road. 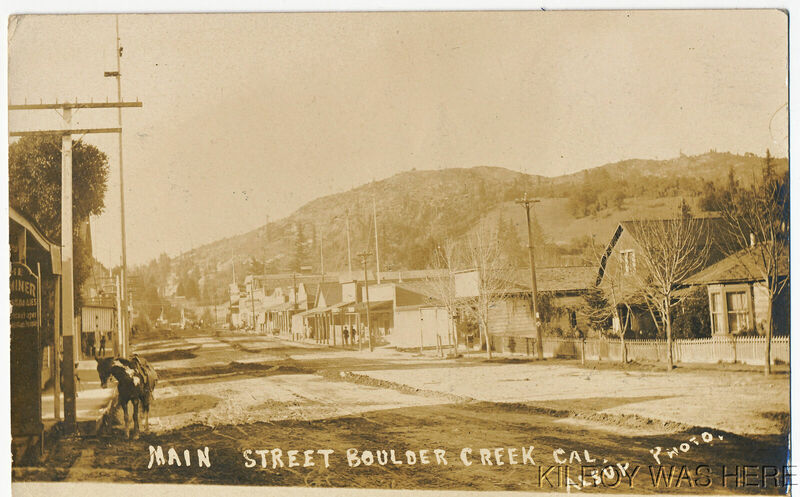 Railroad route between Ben Lomond and Boulder Creek, 1885-1934. Structures and spur lengths not to scale. 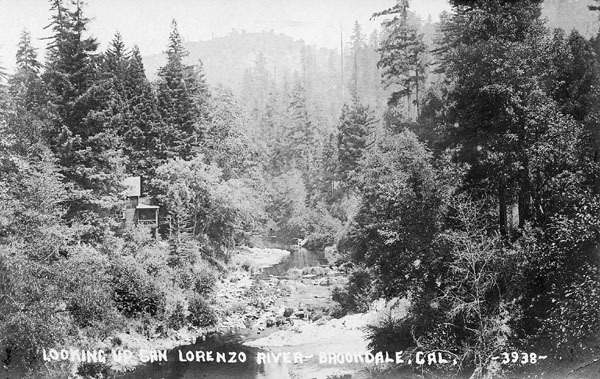 From this meadow, the railroad tracks crossed the San Lorenzo River over one of the most spectacular bridges in the county, after which it ran along the southern side of River Road in a steep cut between the road and the river. Here, the railroad passed its first stop along this stretch: Phillipshurst, established to cater to Dr. Phillips who lived just across the river. Phillips's estate would later become the Blake-Hammond Manor and can still be sighted, with some difficulty, from State Route 9. Unfortunately, the right-of-way in this section is accessible only via River Road, which is privately-owned and maintained so trespassing is not advised. 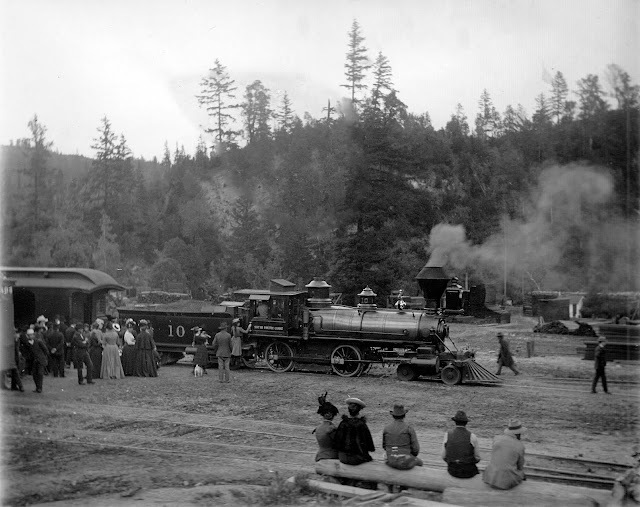 Just before crossing the San Lorenzo River an open deck bridge, the railroad passed the summer cottage of Fred Swanton, who convinced Southern Pacific to set up a stop named Siesta. This stop is also on private land near the southern end of Redwood Street off Riverside Road in Brookdale. 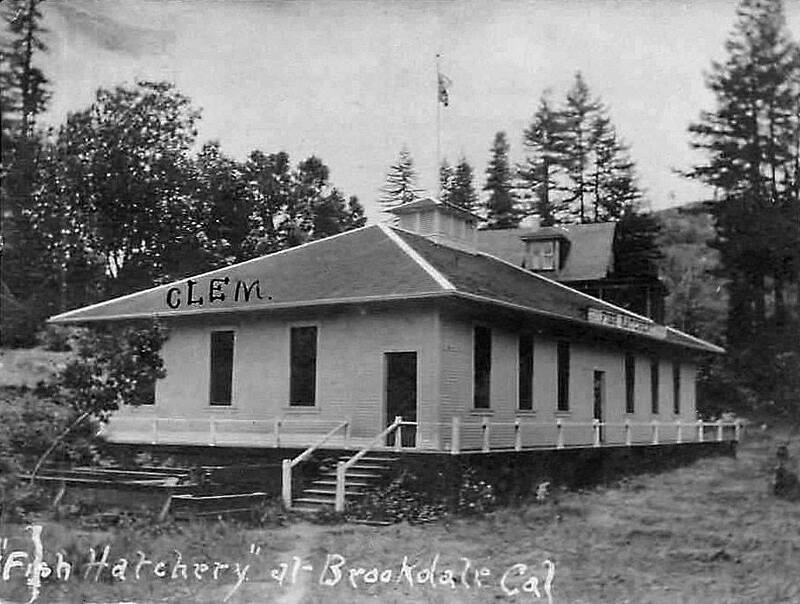 On the other side of the river, after crossing Larkspur Street, the right-of-way passed the Brookdale Fish Hatchery, established by Judge John H. Logan and run by the California Department of Fish & Game. 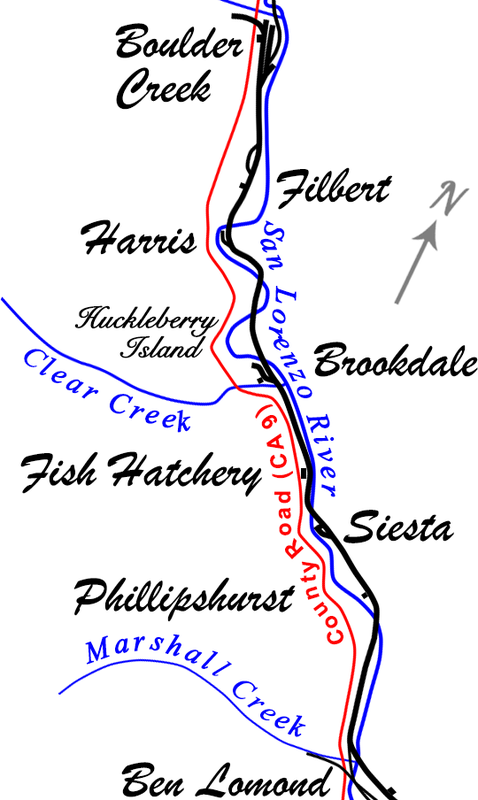 Either because of freight needs or due to its popularity as a tourist destination, the railroad established a stop here named Fish Hatchery, probably along Old River Lane. The tracks continued to hug the west bank of the San Lorenzo River as it rounded to the west toward Clear Creek, which a short open deck bridge crossed just before reaching Brookdale. None of the right-of-way in this area is really accessible and all of it sits on private property. 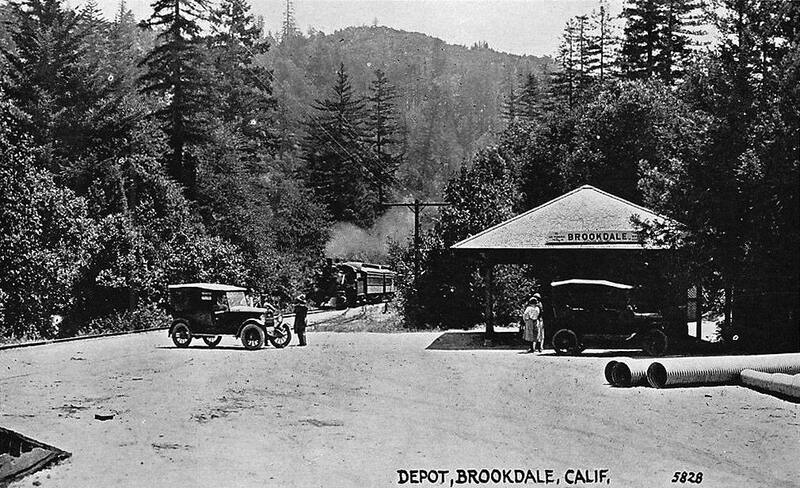 Brookdale is the first station site along this stretch that can still be viewed, although it still sits on private property. The station was located at the bottom of Pacific Street just before the road crosses over to Huckleberry Island. The old post office on the west side of the street still sits as a private residence, but the station itself has been demolished. The large property situated here provided space for the spur and, later, siding that catered to the station, and also allowed room for the fill that preceded the bridge over the river to the west. The railroad tracks once crossed the San Lorenzo River here, and sawed-off pilings of it can still be seen on either side of the river. The tracks then passed through a shallow cut at the back of Huckleberry Island before crossing the river a second time on the other side. While the bridge to the south of the island was composed entirely of wood, the bridge to the north included concrete piers, which are still present today, although it is impossible to see them since the adjacent properties block line-of-sight. 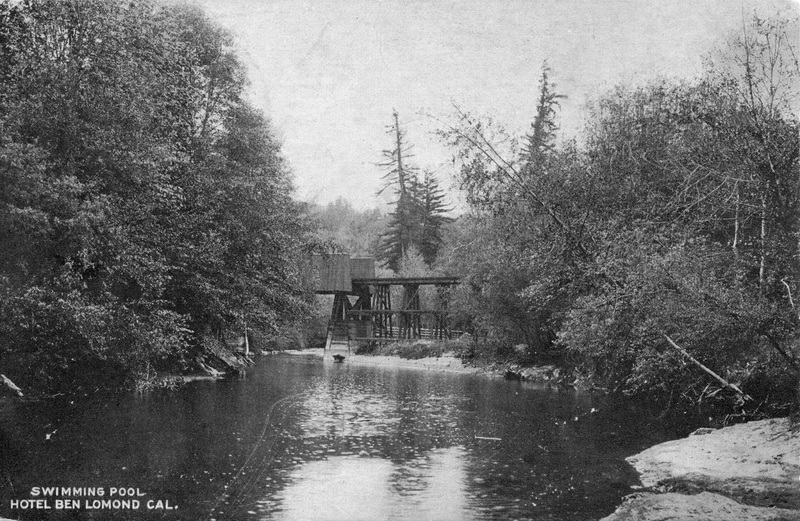 Huckleberry Island may well have served as the railroad's only unofficial picnic stop along the Boulder Creek Branch, but evidence is scarce. From Irwin Way, the railroad crossed the river a sixth time and the concrete piers for this can be seen just to the north from the vehicular bridge over the river. The right-of-way then turned sharply to the west to parallel the river for a short distance, eventually passing into a shallow cut on its way to the Boulder Mill. In later years, the Boulder Mill was renamed Harris, although this stop catered to Camp Joy. All of the right-of-way in this section is on private property and a gate blocks access after a short distance down Irwin Way, although the gated road once served as the railroad right-of-way. Just past Harris, the tracks crossed the river for a seventh and final time, also crossing Malosky Creek in the process. The right-of-way then straightened out on its approach to Filbert, near the end of Grove Street. Little evidence remains of the railroad in this section except the single concrete pier and some overgrown sawed-off pilings beside the river. However, Redwood Resort lingers on as the successor to the Redwood Rest Resort, which probably was the chief patron of Filbert station in later years since the stop was directly behind the resort. Creeping through the back yards of Boulder Creek homes and businesses on a narrow shelf just above the west bank of the river, the Boulder Creek Branch finally broke out into its large freight yard at the place where East Lomond Street turns to the north. From here, tracks split apart in several different directions, with some staying close to the river and others running just behind the businesses on Central Avenue. One track even wrapped up Lorenzo Street to access the Southern Lumber Company yard that was once located where the post office and Liberty Bank is today. The station itself was located just behind the Boulder Creek Fire Department, roughly where the Boulder Creek Recreation building sits at the corner of Middleton Avenue and Railroad Avenue. Except for names—Railroad Avenue, Junction Avenue, Junction Park, Middleton Avenue—nothing from the railroading days survives in the massive open meadow that once was home to the freight yard. But the train did continue on to the north, following Junction Avenue across Boulder Creek, the San Lorenzo River, and then Bear Creek—but that's a story for a different time.